Every couple wants to have fewer expenses on their wedding, having inexpensive wedding flowers would help to lessen the expenses. Flowers could be very expensive since wedding venues are most likely to be filled with flowers as decorations like centerpieces, bouquets and other flowers for the reception venue. There a lot of ways to still have the finest flowers on your wedding without spending too much for it. 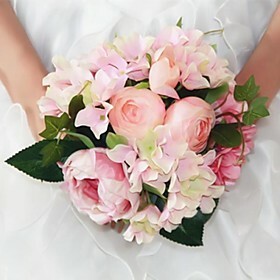 Most brides prefer to do the flower arrangements on their own rather than hiring a florist just to save money. 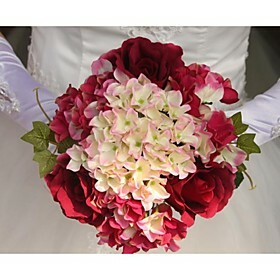 For a spring wedding, there are many colorful and inexpensive flowers to choose from. Sweet pea with its delicate pink hue is a beautiful accent for wedding flower bouquets and centerpieces and is reasonably priced. It was once used as altar decorations for weddings by Italian royalty and is still perfect for spring weddings. 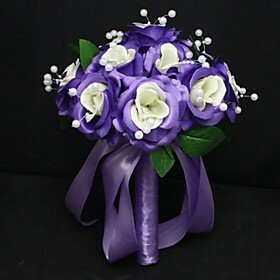 Purple wedding flowers such as irises and lilacs when arranged with delicate pink sweet peas and some traditional white wedding flowers like lilies scream of springtime. Irises come in a variety of colors and are very fragrant, relatively inexpensive, and are a traditional wedding flower favorite. According to legend, a blue iris and a white iris in a vase were placed at a bride’s table signifying that marriage would have its bright times as well as its dull ones, and this was the beginning of the “for better or worse” phrase found in the traditional wedding vows. Chrysanthemums have always been popular choices for wedding flower bouquets and centerpieces. They come in many colors and are inexpensive. 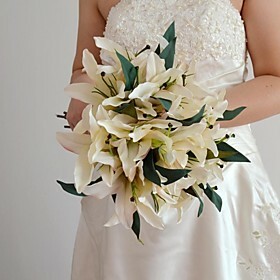 A wedding flower bouquet of peonies, sweet pea, irises, chrysanthemums, lilacs, and lilies can be absolutely breathtaking and easy on your budget at the same time. One idea is to use potted plants instead of cut flowers for centerpieces. Think about it: a really attractive potted mum costs about $10 – $20, and makes a full, lush display for the reception tables. Imagine what it would cost to have the equivalent amount of cut flowers: well over $100 per table, and often much, much more. The nice thing about a potted plant is that you or your guests can take them home to enjoy after the wedding. Another option is to create displays from dried or silk flowers. Not many brides go this route, but if you look around, you can find some lovely alternatives to fresh cut flowers. 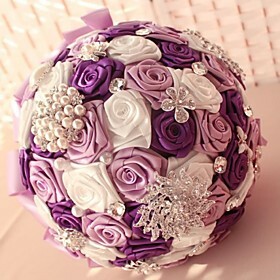 Some of the silk flowers that are available these days look as good as real ones, and you will end up with beautiful lasting arrangements for your new home. Wedding flowers often cost a fortune, but they do not have to. If you look around, you will often find reasonably priced alternatives. With all the money you save on your inexpensive wedding flowers, maybe you can treat yourselves to a really terrific honeymoon! Submit your wedding and be featured!. Contact us to get started. If you're looking for wedding ideas that are different and unique, then you'll find a ton of beach wedding ideas here. Whether you're planning a destination wedding, a romantic wedding at a local beach, or you just want to have a beach wedding theme, I've created this site to make your wedding planning easy.